I volunteer as it allows me to engage with and contribute to the greater community. As a volunteer I have the opportunity to interact with various members and am able to help positively influence them as a mentor. Through volunteering I am able to share thoughts and ideas with the future leaders of our community and can help guide them as they discover who they are and explore their passions and interests. Why do you volunteer with YMCA Calgary? I specifically volunteer with the YMCA because it is a welcoming place to be both as a volunteer and member. The more time you spend in and around the building the more you begin to feel a sense of community and home. Coming in every week for program is like coming to see an extension of family and everyone is eager to hear about what is new and exciting in your life. The YMCA’s four core values are also very important to me and I feel that volunteering with this organization has allowed me to grow and develop individually in those areas and pass on such values into participants’ daily lives. My favorite thing about volunteering would have to be the connections you make both with other volunteers and staff, as well as program participants and members. Every week you learn a little bit more about everyone and are able to grow and develop incredible relationships. A sense of trust and familiarity begin to develop and over time you are able to look back and see just how much those kids have grown and changed. In the first week someone could come in and be extremely hesitant to participate and weary of interacting and over the course of the program you see them begin to form new relationships and become more confident and open. You are able to look back and know that even if it was only one conversation or action you took that you played a role in helping that child discover new skills and helped shape who they are when they leave. What is your Y story? 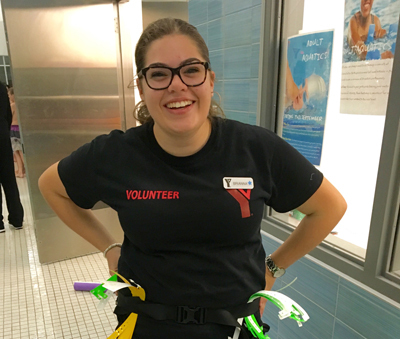 I originally came to the YMCA as a day camp counsellor eager to explore the field of working with youth. That summer quickly became one I would never forget and after camps had ended I was offered the opportunity to continue working with youth as a program volunteer.